ABOUT MITZI The road that led MITZI GAYNOR to international superstardom began in her native Chicago where she was virtually born into the theater. Her mother was a talented dancer and her father a virtuoso musician. Family members and teachers alike were quick to notice and nurture the natural born performing talent of young Mitzi who relished the hours of dance & performance training she was receiving. Her instructor, the acclaimed ballerina Madame Kathryn Etienne, knew from an early age that the young performer was destined for stardom and encouraged the child’s family to seek that stardom in Hollywood and so, the family moved west on a dream. The Emmy® and Golden Globe® winning actress, comedienne and musical performer began her decades-spanning career at the age of thirteen in the Los Angeles Civic Light Opera as a featured performer in the corps de ballet of several Los Angeles, San Francisco and Philadelphia productions such as Songs Without Words, Naughty Marietta, Roberta, Jollyana and The Great Waltz and performed on Broadway in the New Century Theatre production of Gypsy Lady. Mitzi’s vibrant performances were capturing the attention of composers including Cole Porter and Irving Berlin when noted film director Henry Koster and producers Sol Siegel and George Jessel arranged a screen test that resulted in a contract at 20th Century Fox. She transitioned from stage to screen at age nineteen with her first role opposite Betty Grable and Dan Dailey in the film My Blue Heaven. The studio, quick to capitalize on the vivacious talent that would later propel Mitzi to the top ranks of show business, cast her in a succession of audience pleasing comedies & musicals including Golden Girl, We’re not Married, The I Don’t Care Girl and Bloodhounds of Broadway. During this period, Mitzi met the man who would not only become the guiding force of her professional life but also the great love of her personal life, influential agent and marketing genius Jack Bean. Thus began a fifty two year marriage and career partnership that would result in motion picture classics, dazzling television spectaculars and legendary nightclub and concert appearances. Encouraged by Bean, Mitzi starred in her first and only western with Jeffrey Hunter called Three Young Texans then delivered a star-making performance alongside Ethel Merman, Dan Dailey, Donald O’Connor and Marilyn Monroe in There’s No Business Like Show Business. Following that film’s success, she was signed to a lucrative Paramount contract, negotiated by Bean, which would yield three film hits, The Birds and the Bees with George Gobel and David Niven, Anything Goes with Bing Crosby and Donald O’Connor and a praiseworthy dramatic turn in The Joker Is Wild alongside Frank Sinatra. Now an established box-office star, Mitzi was cast alongside Gene Kelly in the lavish, globe-trotting MGM musical Les Girls, but perhaps her greatest film success lie just on the horizon. 20th Century Fox was preparing the film adaptation of one of Rodgers & Hammerstein’s most lauded and successful musicals, South Pacific, and nearly every motion picture actress in Hollywood was vying for the role of Ensign Nellie Forbush. The film’s director, the legendary Joshua Logan, had remembered catching a glimpse of Mitzi during a theatrical audition earlier in the decade. Convinced he had found his “Nellie,” Logan championed her for the part. The composers concurred and Mitzi won the coveted role in a whirlwind of worldwide publicity. The film opened in 1958 to critical acclaim and international box-office success. The soundtrack, featuring Mitzi’s performances of “I’m Gonna Wash That Man Right Outta My Hair” and “A Wonderful Guy” amongst others has never gone out of print and remains to this day a perennial seller. 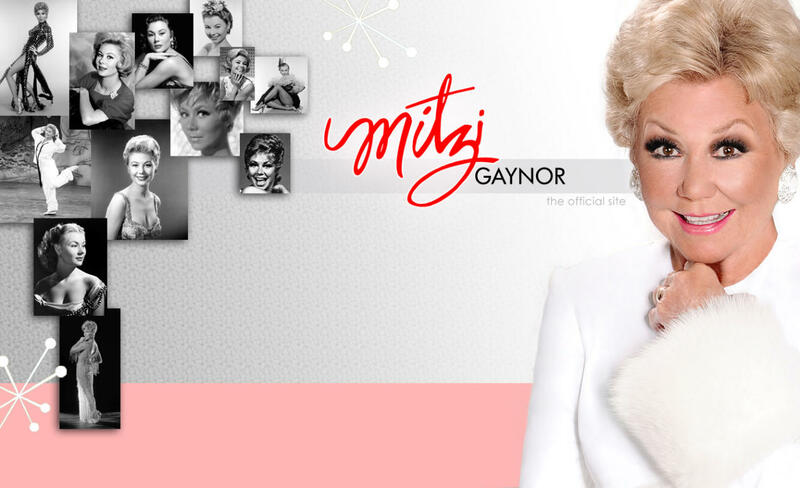 For her performance, Mitzi was nominated for a prestigious Golden Globe® Award as Best Actress in a Musical. Following that success she returned to the big screen in Happy Anniversary, once again with David Niven, Carl Reiner and a young Patty Duke, Surprise Package with Yul Brynner and Noel Coward, For Love of Money with Kirk Douglas and ushered in a new era of acclaim as a live performer. Mitzi first took the concert world by storm in 1961 at Las Vegas’ fabulous Flamingo Hotel. Her debut broke all box office records and was met with overwhelming acclaim - Life Magazine noted “Gaynor started at the top and climbed even higher”, The Los Angeles Times called her “The nation’s number one female song and dance star”- and The Hollywood Reporter proclaimed her “flawless and devastating.” She would remain a major Vegas headliner for more than a decade performing annually at the Flamingo for 4 years before moving to the Riviera in 1966 for 6 years. It was this engagement that brought her the long association and friendship with noted costume designer Bob Mackie. Mitzi was the first star client for whom Mr. Mackie designed an entire show. He would continue to design the lavish, razzle-dazzle costumes that remained a staple throughout her performing career. In 1972 Mitzi moved to the Tropicana where she opened their new Superstar Theatre. Her groundbreaking, high-concept stage shows set the gold standard for performing excellence and established her as a major attraction across the U.S. and Canada from Miami Beach to Vancouver. For the next five decades Mitzi would tour with a high-energy concert act that solidified her reputation as one of the greatest live performers of the era and has long since been simulated by many of the top female talents of our time. Also a highly-sought after guest on the nation’s top television programs, Mitzi also made several memorable appearances in the medium, including a 1964 appearance on the Ed Sullivan Show, in which she had top billing over The Beatles. She also performed to great acclaim on several Academy Awards broadcasts where her show- stopping 1967 rendition of Best Song nominee Georgy Girl, before a TV audience of 65 million, was met with wildly enthusiastic applause. Those successful Academy Awards appearances and an equally popular holiday installment of Kraft Musical Hall titled The Mitzi Gaynor Christmas Show, led to an avalanche of inquiries from virtually every network offering the dynamic performer television series and specials of her own. She fulfilled the requests in 1968 with the premiere of the aptly titled Mitzi. The special debuted to blockbuster ratings, 33 million viewers and unanimous critical acclaim. The Los Angeles Times called it “glittering perfection…a kind of ultimate statement of that particular TV format.” Over the next ten years, she would continue to showcase her magical brand of dazzling showmanship in eight spectacular hours of non-stop entertainment including Mitzi…and 100 Guys (1975), Mitzi…Zings Into Spring (1977) and Mitzi…Roarin’ in the 20’s (1976). Each special was a lavish blend of song, dance and sparkling comedy with costumes by Legendary fashion designer Bob Mackie, choreography by Peter Gennaro, Danny Daniels, Robert Sidney and Tony Charmoli and guests drawn from the top ranks of show business including Bob Hope, Michael Landon, Carl Reiner, George Hamilton, Ken Berry, Jerry Orbach, Benny Goodman, Roy Clark and Suzanne Pleshette. Renowned for their technical and creative achievements, the specials were honored with 17 Emmy® nominations and 6 Emmy® awards. These specials were recently celebrated in the musical documentary Mitzi Gaynor: Razzle Dazzle! The Special Years, which featured clips and commentary from Mitzi herself along with comedy icon Carl Reiner, Bob Mackie, Kristin Chenoweth, Kelli O'Hara and famed director/choreographer Tony Charmoli. It aired nationwide on public television and was honored with the 2010 NATAS Emmy® Award for Outstanding Entertainment Special. Throughout the 1980’s and 90’s Mitzi continued to entertain sold-out audiences at top concert venues and performing arts centers across the United States and Canada and returned to the theatrical stage starring in the national tour of the Broadway revival of Anything Goes. She also added a new dimension to her career as a witty chronicler of Hollywood history in a popular series of columns for the influential trade paper The Hollywood Reporter. She is currently sharing her fabled brand of entertainment in her new show Razzle Dazzle: My Life Behind the Sequins - a glittering multimedia one woman tour-de-force of side-splitting stories and classic songs, along with stunning video footage culled from her television, concert & film work. In reviewing the show, The New York Times called her “an all time great,” Rex Reed of the New York Observer noted “Glamorous, Colossal and one of a kind, Mitzi Gaynor is the real deal,” and The Las Vegas Tribune said “All the ingredients for a great show and a lot of fun.” She recently received the International Press Academy’s Mary Pickford Award for Outstanding Contribution to the Entertainment Industry. She was named the Entertainer of the Year at the 28th Annual Tremaine Dance Gala and received The Chapman University Lifetime Achievement Award. Mitzi is actively involved in various charitable initiatives including The Professional Dancers Society, where she has served as President since 2003. The organization helps both active and inactive professional dancers and works with the Actors Fund of America to provide low income housing, retirement and nursing facilities for entertainment professionals.